You guys don’t know me personally, but I am pretty weird and awkward, and so is my baby! We absolutely love unicorns so when deciding what to do in her new room decor, unicorns were the obvious choice. Our unicorn decor is a win for you because I am going to give you the unicorn SVG cut file. This unicorn wall decal is the best you will find. Why? because you can customize it however you see fit! It isn’t a full animal but just the unicorn face. And I am going to tell you again! 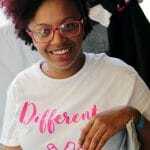 I am giving you free SVG cut file! My daughter is in love with how her room is coming along, I still have a few things that I want to do in there, I have only done the unicorn and her flowers. I am adding a wall quote and then I am going to also redo her dressers. But these ideas are still in the works. 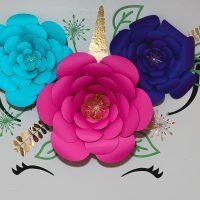 I was really pleased at how my flowers turned out seeings how this was my first time doing them and I made the template myself. She is 9 so, it was time to let go of the Minnie Mouse decor she had in her room. I started by buying her this amazing twin over full bunk bed, which was hell to put together alone, but once it was up the look on her face made it all worth it. This wall decor measures about 50 inches across. What I did was separated the unicorn svg in Design Space and made them as large as I could. The horn itself is 24 inches. So this baby is huge. 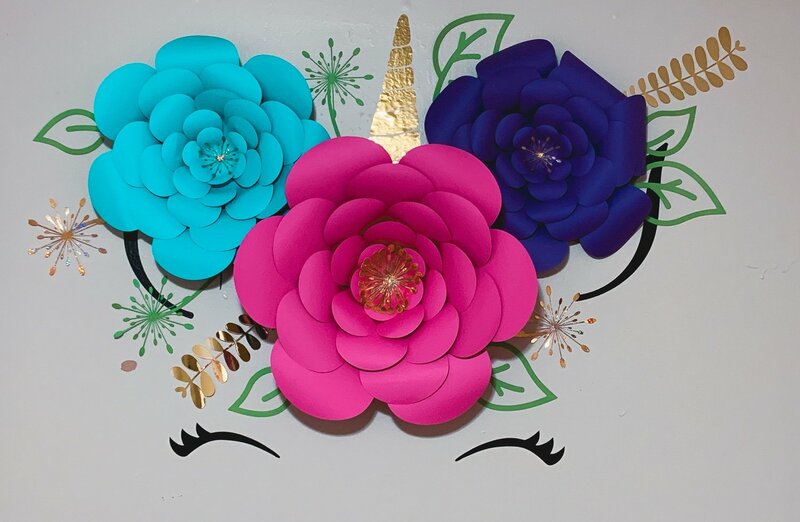 For the giant flowers that you see on my unicorn wall decal, you will want to check out my How To Make Paper Flowers tutorial, the flowers end up being about 22 inches. 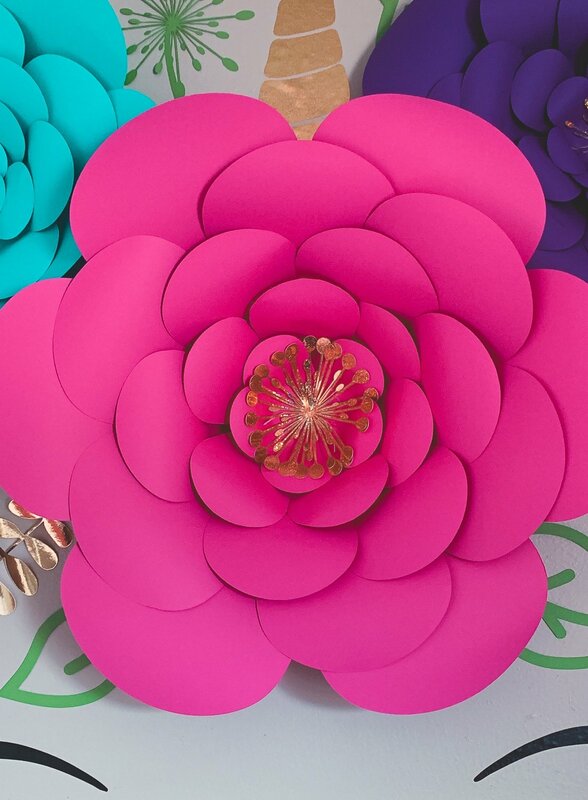 What I did is cut the largest flower petals at 8 inches, and 2 more at 6 inches. 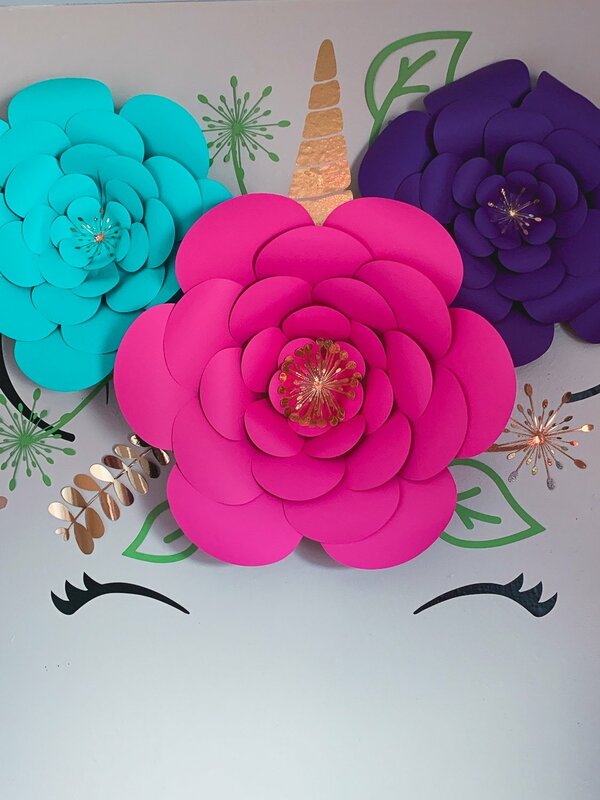 Our unicorn decor is a win for you because I am going to give you the unicorn svg cut file. This unicorn wall decal is the best you will find. When assembling get creative with placement.